A reader reached out asking me if I had tried LISSOM flats. To be honest, I hadn’t even heard of the brand. I visited their website and was intrigued enough to purchase a pair to provide an unsponsored honest LISSOM flats review. LISSOM was started after the founder Jennifer Markham left Pilates and realized how her shoes undid all the good from her class. 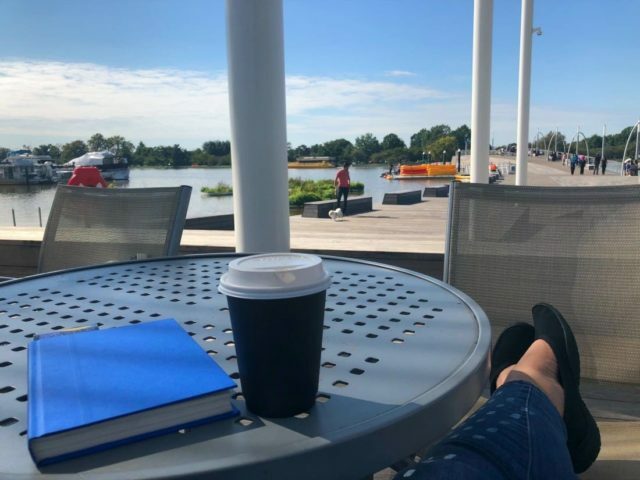 She shares, “I realized the shoes I was wearing outside the studio were dulling my senses and core connection from the ground up. In ballet flats I felt myself clawing my toes to hold on, flip-flops made my back hurt, and sneakers felt over-padded and restrictive.” She desired a shoe that allowed her feet to be grounded, thereby improving communication with her core and helping her move better. She couldn’t find anything on the market that did all that and also looked cute so she took it upon herself and in 2017 LISSOM Flytes (the name of their style of flat) was born. I liked the modern, almost space-age style, loved that they were vegan, extremely lightweight, and washable. Unlike other flats I had, these were designed in the shape of a foot, with just the right amount of cushioning. I have wide feet, short toes, and am prone to pronating. That combination isn’t great for flats. I regularly deal with stretching flats out because my feet aren’t the same shape. I have so much toe cleavage my pinky toe pops out or gets mangled. Often flats with cushioning look frumpy; these looked cool in a forward-thinking style that would be right at home with a wardrobe of clean, modern basics with an edge. The uppers of LISSOM Flytes are made from several stretchy layers of Lycra and other activewear fabrics. The ultra-lightweight, high-grip, super flexible outsole is made of a patented blend of rubber and other traditional running sole synthetics. The insole is removable, the rise of the shoe high enough to accommodate some orthotics and insoles. LISSOM has a 30-day money back guarantee so you can truly test drive their shoes to be sure they’re great for you. I ordered a pair of LISSOM Flytes in Black with Black Sole in size 8, my regular shoe size. The shoes arrived quickly, in a beautiful box. Since I ordered the shoes during a pre-order period, my shoes came with a pair of LISSOM bamboo socks, which are very low-profile and completely hidden when wearing their shoe. These help the shoes be more comfortable and less likely to get sweaty and stinky with wear. LISSOM recommends wearing the shoes a couple hours at a time to get adjusted to them. I put them on and they were instantly comfortable… yet felt weird. You’ll see from the photos that the sole sticks out a bit from the back of the foot. This is to bring greater control to the foot while accommodating lots of different foot types, and it takes a bit of getting used to. Also, the sole of these shoes are drastically different from any other shoe I’ve worn; it’s not rigid and its shape goes with the shape of a foot with additional padding in the sole and the ball of the foot. It’s a unique feeling walking in LISSOM flats, sort of like being barefoot yet protected. You can walk on gravel and hot asphalt but you also feel the shape of the ground beneath you. I didn’t wear these for little bits at a time to get used to them. I planned to do a review several months ago and kept them in the box until I could get to it. 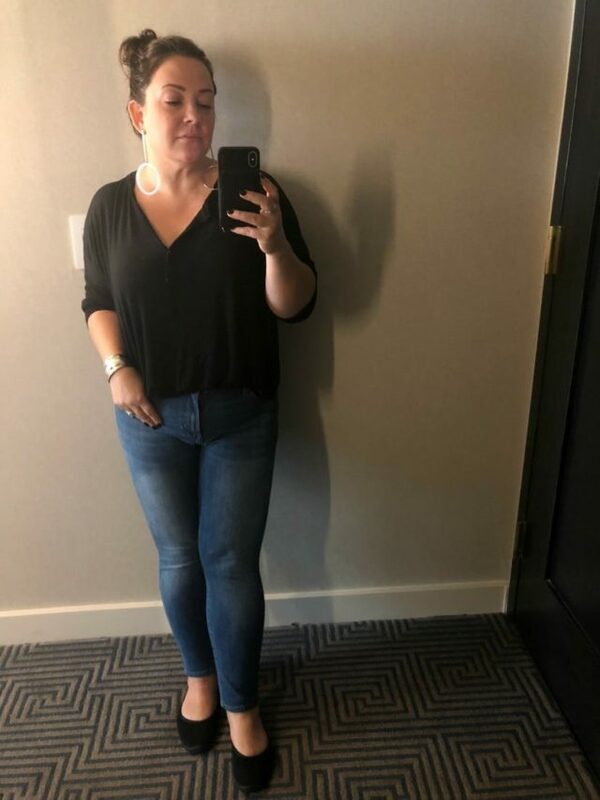 The 30 days went by, and then I was taking a flight and wanted a super easy shoe to slip in and out of at TSA that would also work with a variety of outfits I packed. I grabbed the LISSOM Flytes and my inaugural wearing was on a flight. I made the mistake of wearing new shoes to the airport a year prior. What appeared to be super cushy comfy shoes destroyed my feet. I was left with bloody blisters on both ankles and hotspots on the balls of my feet. I did NOT experience that with the LISSOM Flytes. They survived a frantic dash to my gate, a long trip to baggage claim, and activities before I could get to my room. I wore them several times throughout the trip and used them as slippers when padding around my room. They felt like a hybrid between ballet flats, sneakers, and slippers and I was a mega fan. My mistake with LISSOM flats is I didn’t give them that break-in period. Yes, they were super comfy but because I didn’t give them much time to cool off and bounce back, I stretched them out a bit. I wore them here and there for weeks after the trip, running to the market or to take my kid to school, not long trips and they seemed fine. Then I had a weekend getaway and took them as the primary shoes for the whole weekend and that’s when I realized I stretched them out. My feet, even in the bamboo socks, were sliding around and the shoes made a squeaking noise when I walked. I walked off a step and the shoe gripped the ground while my foot went another direction, twisting my ankle. Once home, I decided to wash the shoes for the first time, thinking it would help them bounce back. That it did! I removed the insoles, and to be sure the shoes didn’t get damaged in the washing machine, I put everything in a lingerie bag, washed on gentle, cold water, liquid detergent. The shoes came out looking great… and the washing seemed to do the trick! The shoes fit again like they did when I got them. 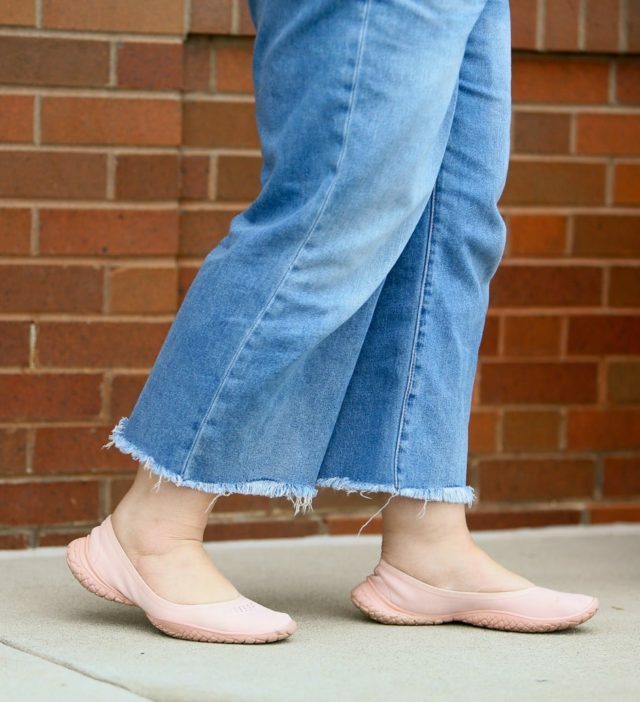 I began wearing them regularly; they make an appearance in this outfit post. LISSOM saw a decent amount of traffic from my site after I featured them and offered to send me another pair in thanks. This time I chose a pair in Blush, figuring they would be a low-contrast neutral that would work with a variety of outfits. This time I followed the instructions. I wore them for two hours around the house, waited a day, wore them again for a couple hours, waited a day, and then wore them for a bit longer. This “breaking in” period seemed to “train” the shoes to mold to my feet and seemed to help them better handle my pronation. I’ve now owned the Blush LISSOM Flytes for a few months and the black for seven and I have to say they are some of the most comfortable shoes I own. They take a bit to get used to them, they are unlike any other shoes you own. That, plus these shoes look cool. I’ve worn them with dresses, with ankle jeans, with cropped wide-legged pants. 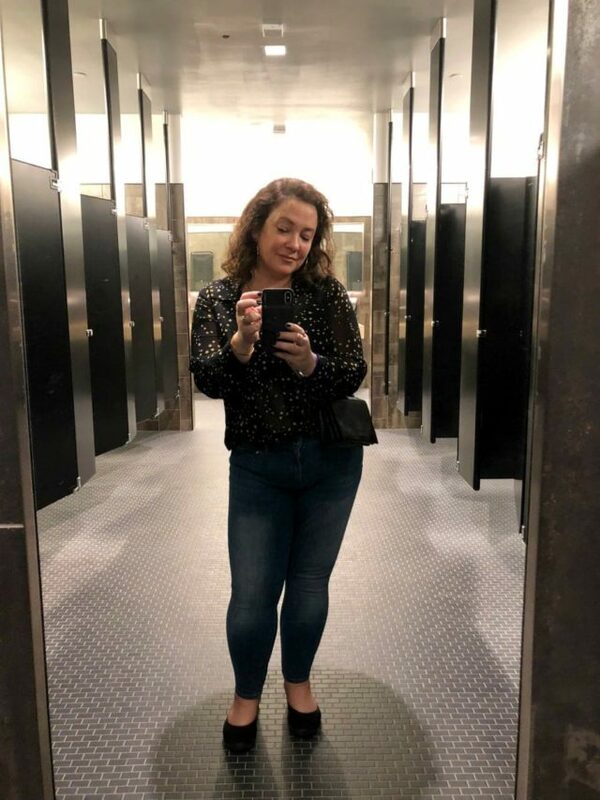 I find them to be far more stylish and versatile than a classic ballet flat, and kinder to my feet for long periods of time than my Rothy’s flats. Also, LISSOM are cheaper than most of the popular brands of flats currently on the market. While I would likely stick to a supportive sneaker or boot for hikes and long days of sight-seeing, my LISSOM Flats have become a must-pack for every trip and from spring through fall they’re the most worn everyday shoes in my closet. I’m glad to have waited to write this LISSOM flats review. If I wrote it after my trip to Florida, it wouldn’t have been so glowing. If I didn’t have the opportunity for a breaking-in do-over with the second pair I wouldn’t have understood the importance of allowing the shoe to get to know your foot. Want to learn more about LISSOM? Do visit their website where they have an extensive FAQ page and customer testimonials. LISSOM is offering Wardrobe Oxygen readers a special promotion. Add a pack of their bamboo liner socks to your cart then use WARDROBEOXYGEN at checkout you'll get them for free (while supplies last). These socks fit under the LISSOM Flytes perfectly. They are extra-absorbent, anti-bacterial comfort to keep your feet warmer in winter and cooler in summer. They also reduce how often you need to wash your shoes. Are LISSOM flats machine washable? Yes, though I don’t recommend doing it often. The fabric is sort of like neoprene, so it’s easy to spot clean (I do quite often with Bac-Out). I have washed the insoles more than the actual shoe to keep the shoe in great condition. Do LISSOM flats work with insoles? Technically yes, and far better than my other flats, but I find it awkward. LISSOM shoes are very stretchy, and I found insoles didn’t sit quite right. That being said, I absolutely need insoles in other flats to be comfortable for long periods of time standing and walking. I don’t have that need with my LISSOM flats. Do LISSOM flats fit wide feet? Yep, I have wide feet and they’re great. A reader let me know she also bought them. She has very narrow low-volume feet and finds them a good fit. Can you wear LISSOM flats on cobblestone, sand, or gravel? Yes, though I wouldn’t wear this shoe sight-seeing in a city that has predominately uneven ground. They provide more cushioning than bare feet, but they are just flats. I’d recommend a more structured shoe for such situations. Do LISSOM shoes give you toe cleavage? No, and that’s another reason why I like these shoes. I have such short toes I have cleavage in most flats and pumps but not in LISSOM. Woot! Do LISSOM flats smell? I have smelly feet, but I find LISSOMs smell less than the other flats that I own. I just don’t seem to sweat as much in them. They have air vents right above the toes, and the bamboo sock liners help greatly. Also unlike insoles in many other shoes, when I wash these they truly get the funk out. I have plantar fasciitis, can I wear LISSOM flats? LISSOM discusses plantar fasciitis, pronation, and other foot issues in their FAQ. I do have pronation and a fallen arch. 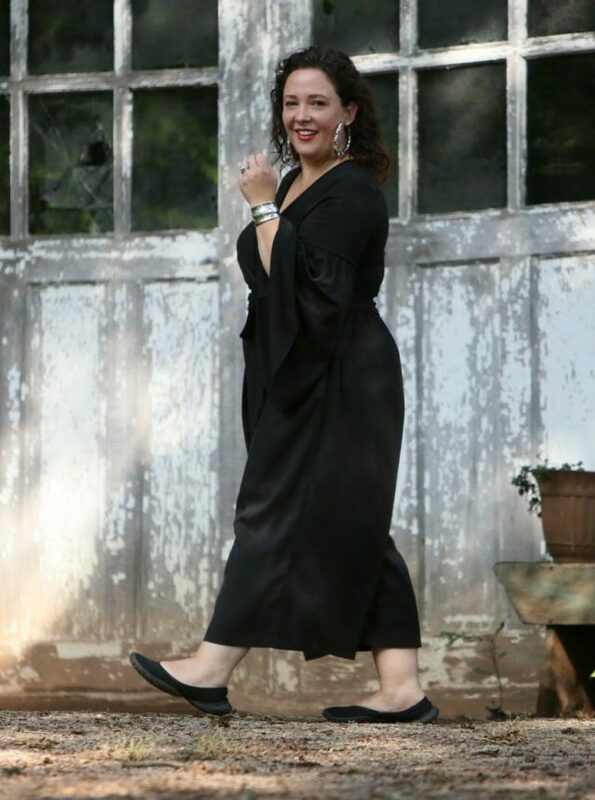 I find LISSOM more comfortable and for longer periods of time than any other flats. However, I am not a doctor and I don’t know your body. I recommend you discuss it with your podiatrist. Will LISSOM fit if I have bunions? I don’t have bunions but the uppers of these shoes are so stretchy, soft, and comfy. They may be a good choice depending on the type and size of your bunion. LISSOM did not sponsor this post nor did they ask me to write it. One of my two pairs was a gift from the brand, the other I paid full price. There are affiliate links in this post; if you click on one and make a purchase I may make a small commission. Feel free to ask any questions in the comments and I will answer honestly. Previous Post My Closet Cleanout Left me Without Clothes! I’m so glad I found your review! I stumbled upon Lissom, I think Instagram, and have been considering these shoes for an upcoming trip to Europe. There will be a ton of walking! I’m hoping to wear them on our excursions. I’ve been going back and forth between black and blush. I want something I can wear with “everything”; capris, dresses, jeans. I think blush it is, especially since they seem more summery. Your review helped me make the decision. Thank you!! They lose most of their custom fit after washing, but not all. Will you tag this post in shoes? I knew I had ordered these shoes after seeing it on your blog but could not remember the name at all and couldn’t find them by searching for shoes on your site. So I had to scroll back through old posts to figure out the name of the shoes. Thankfully, it wasn’t too far! That’s a great suggestion, I’ll work that in! Love your honest and detailed reviews. Flats are hard for me, I may just give these a try after reading their FAQ. If you do I hope they work for you as well as they did for me! Thanks for the honest review Allie! Your reviews are one of the most valuable parts of your blog and I really appreciate them, I have been so curious about Lissom but hesitant to pull the trigger. Your review plus the offer convinced me to give them a try. Thank you! I know it’s hard to find detailed reviews these days, especially when there’s affiliate money at stake for so many websites. I write the kind of reviews I want when I’m making a purchase. I hope you like them! I appreciate the 30 day guarantee, since the product is something of a paradigm breaker. It’s tough when you try new shoes and realize they’re not for you only after you’ve worn them enough to make them nonreturnable. I fully agree! You can’t determine the comfort level of a shoe walking in circles on your bedroom carpet. The trick is that you have to put the socks into the cart prior to entering the code….then they are credited as free. What is the code good on? You convinced me to try and I’ve got the black flytes in my cart. I’ve entered your code and it says it isn’t valid for these shoes. Any ideas? I know you got a response in the FB community, but to help others I reworded the post to clarify the promo code. Thank you Lisa!